The top-secret electromagnetic satellite known as GoldenEye has fallen into enemy hands. It is believed the Janus Syndicate, an international terrorist organization, has stolen the key to the device in an attempt to render the world powerless. Your mission is to prevent the satellite from being activated. 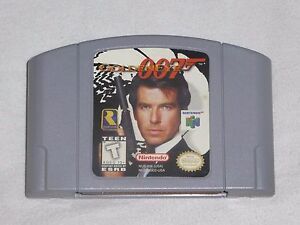 Rare's third Nintendo 64 game is a first-person shooter based on 1995's GoldenEye, the film marking Pierce Brosnan's debut as spy James Bond. The action spans 18 missions, each featuring multiple objectives, from powering-down a communications dish to disarming bombs. Nineteen weapons range from silenced pistols and sniper rifles to proximity mines and throwing knives. To help you complete your objectives, Q has supplied your character with an array of gadgets. These include a covert modem, watch laser, microcamera, bomb defuser, door decoder, key analyzer, watch magnet, and plastique. After fulfilling your duties for Her Majesty's Secret Service, the single-player game is not over. Another difficulty level becomes available, offering new objectives to fulfill on top of previous ones. Enemy soldiers will also become harder to defeat. You can also challenge up to three friends in the split-screen multiplayer mode. Eight scenarios, named after Bond films, offer varied styles of play, from standard deathmatches to team battles. In "You Only Live Twice," each player is given two lives to eliminate the opposition. The The Living Daylights" has you trying to hold a flag for as long as possible. "The Man With the Golden Gun" involves searching for the pistol that kills with one bullet, while "Licensed to Kill" makes every shot fatal. Adjustable options include time or point limits, arena location, weapons, and health levels. $1.50 shipping for each additional eligible item you buy from gthemasterj, when you use the cart to make your purchase. Tremendously fast communication and shipping! Product was exactly as advertised! Arguably the best N64 game. The campaign is fun and challenging. The multiplayer is fun too. I love cheating by peeping the opponent's screen. So easy to set a mine on the other side of the door, then screen peep to know when to detonate. I like to be Oddjob. Crafty little guy is impossible to kill. I also like to turn auto aim on. I can just press a button to instantly kill. It makes me feel like I'm good and it's so easy. I literally don't have to aim. Everything about GoldenEye 007 is nostalgic. From the music to the multiplayer; I love everything about this game. Nothing takes me back to the late 90's more than Pierce Brosnan in N64 graphics. I am very pleased with this purchase. Older games are hard to buy especially in good working condition. But this game turned on no problem and works great. I could list pages, but the bones are; You'll love it if you grew up with it, and the views/controls. You'll dislike it if you're new to retro gaming and are looking for next Gen control, or think this will be like new age fps. Taking me back to 1998! Oh man, I started up the console and the flood of memories came back! The game works just like new and so excited to play it. Great value. Thank you!